Saskatoons (Amelanchier alnifolia) are more commonly known as serviceberries, sarvisberries, juneberries, or shadbush on the Atlantic Coast where they flower right around the time the shad run. The fruits are pulpy and reminiscent of blueberries both in look and taste, although their seeds have a nutty flavor and botanists will tell you the fruits are actually pomes, making them relatives of apples and pears. I missed the main fruiting of sakatoons in Washington this summer, but here in Steamboat Springs, Colorado, where we're visiting the rellies, saskatoon berries are in full flush. Near the Sarvis Creek Wilderness—a place that might have been named for the abundance of sarvisberries—I fished the Yampa River for monstrous rainbows while Ruby and Marty loaded up on the berries. 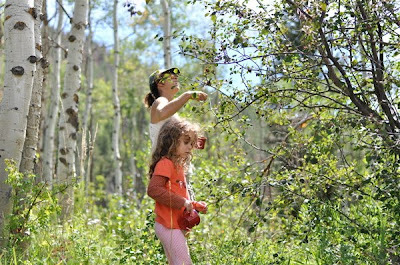 Harvesting saskatoons is one of those exercises in berry-picking that will restore your faith in the process after earning a case of carpal tunnel from red huckleberries: the berries are big and hang in clusters that make for easy pickins and quick buckets. That is, if it's a decent crop. Some years the fruits are less than plentiful. 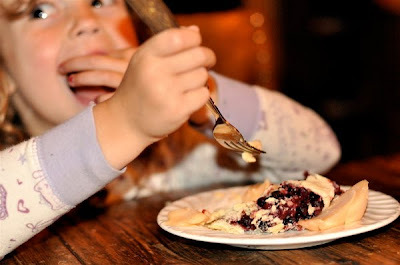 We made pie with ours. Glad to see someone else giving saskatoons some love. We call 'em service berries, and we just made jam with a little rhubarb in it. Yumm... I also read somewhere awhile ago that they used to be called poor mans blueberries. Perfect for me, I have about 5 quarts frozen in my freezer. Here in NYC we picked the first two weeks in June. With sumac berries they make a delicious jelly. Such a big harvest this year, I'm brewing my first gallon of Amelanchier wine. Ah! I am having a Montana/Idaho adventure and see that our berry-picking and internetless, river-centric dog-days are sort of mirrored. 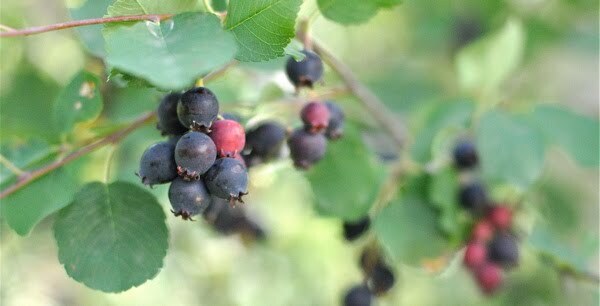 Haven't found any saskatoons in Idaho and am regretting not picking any for jam while in Montana, where they abounded. Anyhow, tonight I'm on a mission to find your elderberry and huckleberry jam recipes, which I'll be making before heading back to California. PS. Having never seen "sarvisberry" written, I had always heard it as serviceberry, which seemed so pedestrian. Great entry! Thanks so much for sharing. Very nice and ooooh that pie looks tasty! I picked some today after ID-ing them; never had serviceberries/saskatoons before, but I like them more than Salal, which they remind me of, taste-wise. Anyway I'm making a jam with the bowl I picked.